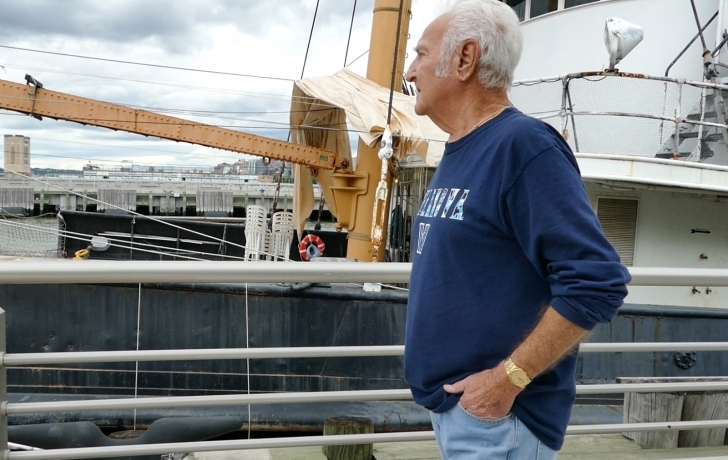 Slowly but steadily, Thomas Cannuli, 79, made the steep climb to the deck of Lilac, the former lighthouse and buoy tender docked at Tribeca’s Pier 25. Step by deliberate step, he ascended the same ladder he had climbed up and down countless times as a Coast Guard seaman, some 60 years ago. Now Cannuli’s son-in-law was close behind. “Keep leaning forward,” said Stephen Byrne, cautioning him about an overhead piece of steel. “I used to fly up those steps,” Cannuli muttered with a smile as he returned to the daylight of the deck. Indeed he did. As a small-town kid from New Jersey, fresh out of high school, Cannuli was chipping paint, scrubbing the deck, keeping watch and doing the many other duties of a Coast Guard recruit on the 174-foot-long Lilac, now a nautical museum. During Fleet Week last month he was reuniting with the old vessel, stepping into the cramped spaces where he had lived most of his four years, from 1955 to 1959, as the member of a crew that supplied lighthouses and maintained buoys along the lower Delaware River and Delaware Bay. More than nostalgia, Cannuli’s memories would add to the bank of knowledge about Lilac, the country’s only surviving steam-powered lighthouse tender. Some of those veterans, she said, have provided information that helped with the restoration while others returned important “souvenirs” of the vessel, like its wheel, and the builders plate, a collector’s piece installed by the shipyard that constructed the boat. Still others, like Cannuli, have filled in missing details about life on the Lilac, the kind of information that Habstritt said the public wants to hear about the most. Now as Cannuli, who lives in Beverly, NJ, stood at the ship’s wheel and remembered his captain, “a tough man,” or walked the deck that he’d swabbed and painted, the decades dissolved and the memories quickly returned. “I slept on top of that wood thing there. That’s where my bunk was” Cannuli said, pointing to what now is a bench in the ship’s workshop.